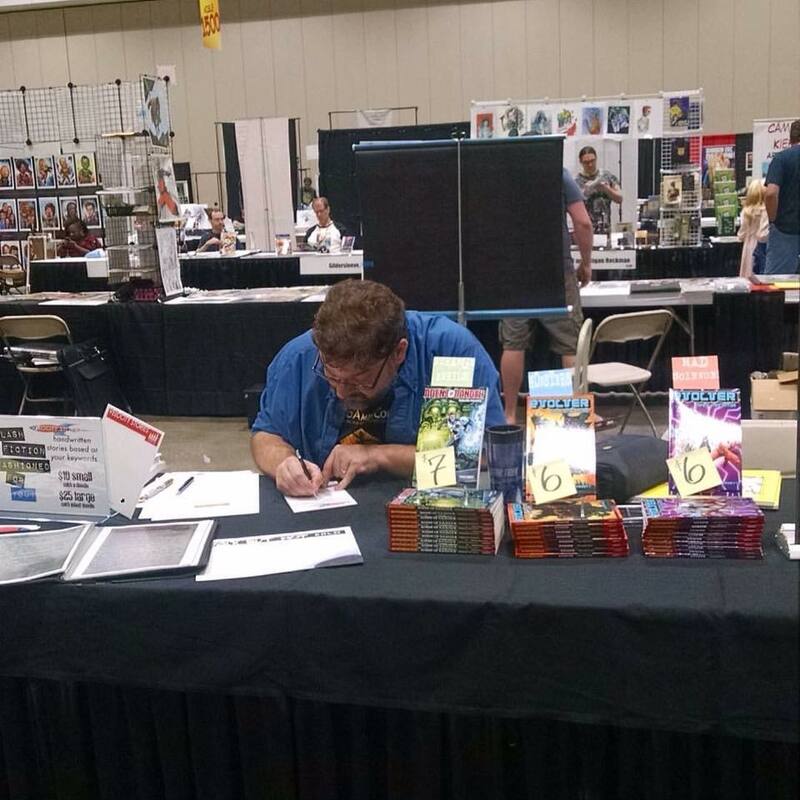 Had a great time at Kansas City Comic Con this past weekend. August 12-14, 2016. (I'm woefully behind on so many things!) 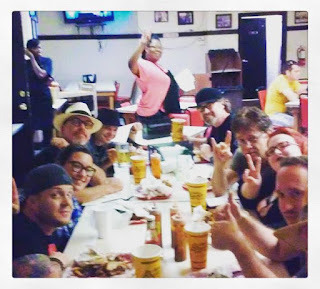 I got to share a row with good friends Holly Messinger, Dayton Ward, Kevin Dilmore, James Young, Anita Young and a new friend in Jonathan Maberry. Across from us were buddies Nicholas Forristal, Thaddeus Nowak and A.R. Crebs. So many other friends were all around us that it felt like home for three days. I scored a bunch of great reads, including Jim Starlin's Mystery in Space featuring Captain Comet (an old fave of mine) and the 1976 Howard the Duck Treasury Edition. I also acquired a collection of Marvel's Doc Savage comics from the 70s, but it was published by DC, who had the rights later on in the early 90s. I love it for the Ross Andru art. Though I was only scheduled for two panels, I ended up doing three. My first panel on Friday got moved to Saturday due to some snafus in the airlines properly delivering Jonathan Maberry to Kansas City. Everything got rescheduled for the same time the next day and eventually he made it safe. On Saturday morning I moderated the writer's panel with guests Forristal, Nowak, Brian W. Peterson and new to the show writer J.B. Garner. It was lively and funny and the tables stayed on the stage this year. After the panel I was ready to leave when I was press ganged by the writers coming in after. They insisted I stay to moderate their panel. So the next writer's panel featured Messinger, Crebs, Bethany Hagen and Jae B. Wells. There were more attendees and the novelists talked about what it takes to be an author. It was livelier and entertaining and full of laughs. Seriously. Hagen is really funny on a panel. Then it was back to the table to try and sell some books or hawk a couple of Velocity Stories for commission. 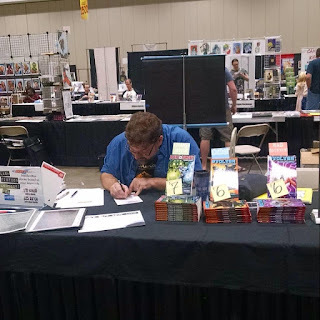 Though I talked to a lot of people, not much moved off my table except for bookmarks either Friday or Saturday. I have to attribute it to the lack of new books written by me and the trends I see in my day job. Presidential election years are notoriously slow, with some parts of the population just holding on to money out of fear of whatever may come. New books will appear on my tables after the new year, at least three and maybe more, and the election will be resolved. I pass no judgement on anyone but from an artist's point of view, it's frustrating. Luckily friends Kristofor Harris and Scott Drummond and C.W. Cooke were around to chat with and commiserate. 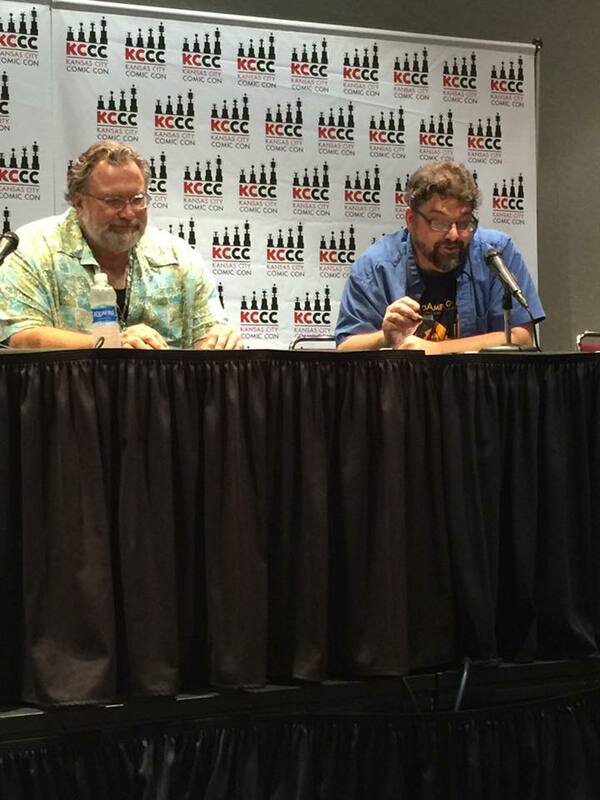 But the high point of my weekend, and maybe my career at conventions, was the interview panel I had with Jonathan Maberry. We had messaged back and forth a little on Friday when it was clear he would not be in the building for the 4 PM panel but met early on Saturday. In preparation for the interview I read/listened to the first Joe Ledger book, Patient Zero, and the first book of his Rot & Ruin series. I'm not a zombie guy (Maberry is) but he told compelling stories with these horrors that made me a fan. After our panel together, and chatting off and on during the weekend, I'm a bigger fan of his. He's just one of the coolest cats you'll ever meet. Maybe I'll get to do more panels with him as I expand my catalog and con base. Buy me a drink and I'll share the stories with you. There was a lot of BBQ involved, there was a great dinner on Friday with one of my oldest and dearest friends that's a KC convention tradition, and another dinner on Saturday with friends old and new, including Shannon Denton, Brent Peeples, Ande Parks, Andy Kuhn, Frank Barbiere and Bo Hampton. I could not have asked for a better time. Justin and the team took exceptional care of me and the cohort in our row of Artists' Alley and I look forward to returning next year. Hope you'll come out, too. My next appearance will be at Freestate Comicon on October 1. Would love to see you there.